Wednesday August 4th 1982: As the fifth place New York Mets (46-58) were in Chicago to play an afternoon game against Lee Elia's sixth place Chicago Cubs (42-66) in front of 9,237 fans at Wrigley Field. It was to be a strange , historic day for Mets player Joel Youngblood. New York Mets Manager; George Bamberger, was well aware that dat that a trade was being put together for his outfielder Joel Youngblood. 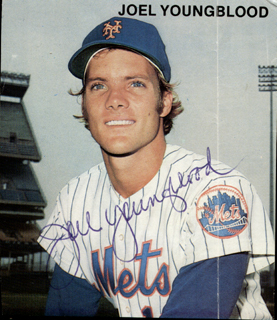 Youngblood had been with the Mets since 1977, mostly used as a fourth outfielder, although he was pretty good player, especially on a poor team. When a young Mookie Wilson arrived with the Mets, there was less playing time for Youngblood. He felt he was good enough to start on the poor club & if not, he asked to be traded. The Mets new ownership, now under Nelson Doubleday / Fred Wilpon, had already begun trading away players from the previous era anyway, so his days in New York were numbered. Manager, George Bamberger penciled in Youngblood as the Mets clean up hitter, in the Mets line up that day. Youngblood struck out in his first at bat, then in the 3rd inning; he singled, driving in two runs with a base hit off Cubs pitcher & future Hall of Famer; Ferguson Jenkins, putting the Mets ahead 3-1. 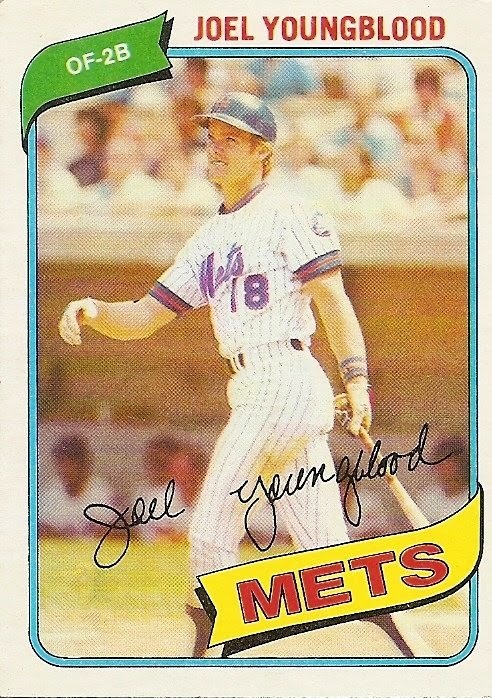 In the 4th inning, the Mets Manager took Youngblood out of the game. Youngblood was surprised and went over to talk to the manager about the move. Bamberger then informed him that he had just been traded to the Montreal Expos. 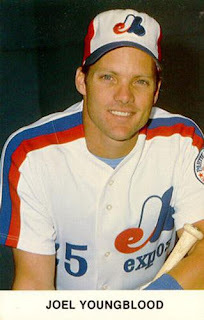 The Montreal team was short players and wanted Youngblood to join the ball club as soon as he could. They were pushing to see if he could make it to that night's game scheduled in Philadelphia. Youngblood exited the Mets dugout, showered, packed his bags and got a cab to the airport. It was then he realized he forgot his glove, and had to go back to the ballpark to get it. He eventually caught the next flight to Philly, arriving at Veterans Stadium just as the game began. There the Expos already had a uniform waiting for him with his long last name already spelled out on the back. Youngblood now the Montreal Expo, got dressed and walked into his new team’s dugout getting greeted by Montreal manager; Jim Fanning. Fanning inserted him in right field, replacing Jerry White in the sixth inning. He came to bat in the top of the 7th and singled off the Phillies future Hall of Famer; Steve Carlton. 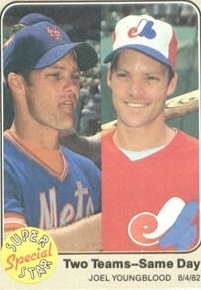 Youngblood made baseball history, becoming the first player to get two hits on the same day for two different teams. It must also be noted that he accomplished the feat, against two future Hall of Fame pitchers. At the end of 1982, he would become a free agent & sign with the San Francisco Giants.